This revised and updated edition of Sacred Pathways will encourage you to see strengths, weaknesses, and tendencies in your devotional approach to God. Gary Thomas, bestselling author of Sacred Marriage, shows you how to improve your quiet time and personal worship life so you can strengthen your walk with the Lord. 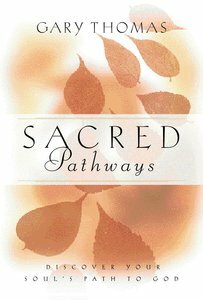 In this revised and updated edition of Sacred Pathways, Gary Thomas strips away the frustration of a one-size-fits-all spirituality and guides you toward a path of worship that frees you to be you. Experienced spiritual directors recognize that all of us pray differently; if your devotional times have hit a snag, perhaps it is because you're trying to follow someone else's path. Sacred Pathways unfolds nine distinct spiritual temperaments-their traits, strengths, and pitfalls - to help you eliminate the barriers that keep you locked into rigid methods of worship and praise. You'll also discover other temperaments that are not necessarily "you" but that you may wish to explore for the way they can stretch and invigorate your spiritual life. Whatever temperament or blend of temperaments best describes you, rest assured it's not by accident. It's by the design of a Creator who knew what he was doing when he made you according to his own unique intentions. If your spiritual walk is not what you'd like it to be, you can change that, starting here. Sacred Pathways will show you the route you were made to travel, marked by growth and filled with the riches of a close walk with God.